Like BC, the Seirra region of California is littered with abandoned and orphaned mines, a legacy of the Californian Gold Rush. Mercury used to process gold at these mines still leaches into local waterways, and many physical hazards remain. 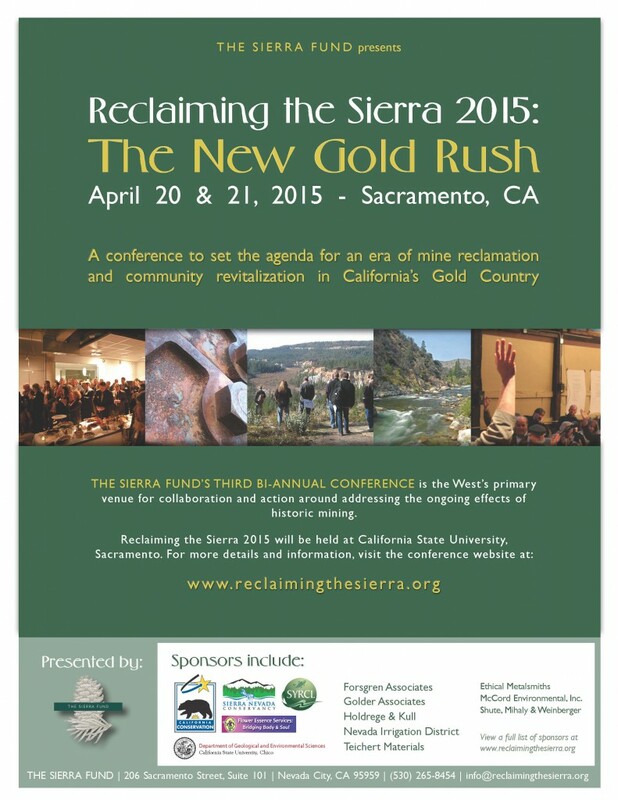 We at Fair Mining Collaborative are proud sponsors of The Sierra Fund’s third bi-annual conference, Reclaiming the Sierra 2015. This year, The Sierra Fund will devote an entire conference track to prioritizing efforts to address legacy contamination and physical hazards, the 150-year-old remnants of California’s Gold Rush. Amy Crook, FMC’s Executive Director, will be presenting at the conference, as part of a panel discussion on the definition and marketing of E3 gold. (E3 = Environmentally sound, Economically viable, and Ethically mined).